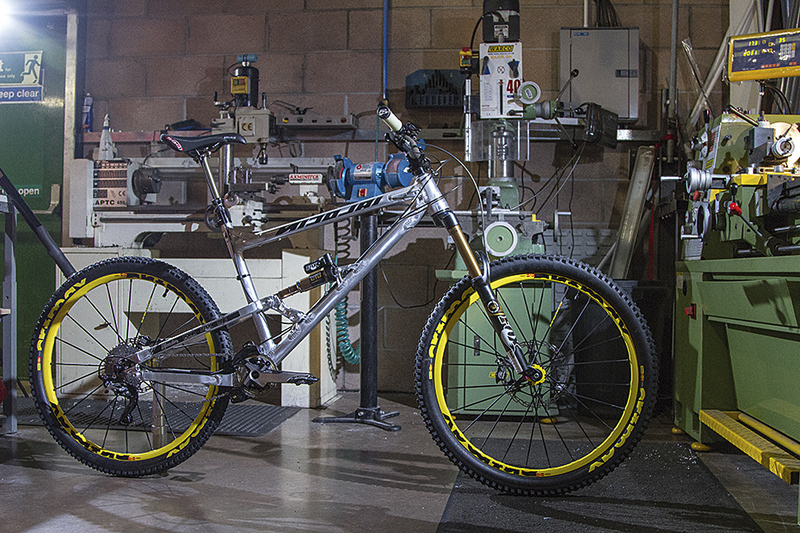 Chris Porter explains why he thinks mountain bike designers are getting it all wrong. Mountain bike sizing is stuck in the Stone Age, and I think it’s because of our shaven-legged, tarmac-riding compadres. I’ve never had a mountain bike that has truly fitted me until I got one of Mondraker’s first Forward Geometry frames. With that bike I could finally run a short stem, to get steering precision, but still have enough length in the top tube and wheelbase. My experience with this original Foxy XR has sent me down a path of discovery, and I’ve yet to find its end – I’ve since made an even longer custom frame and it’s still not too big. Fitting a longer stem is NOT the same as making the frame bigger – there’s some advice to the mountain bike industry… for free! In many ways it seems like the mountain bike has evolved along similar lines to an off-road motorcycle; suspension, braking and tyre technology have much in common. But it’s also clear that stem lengths and sizing conventions have evolved from road bicycles. The problem is, mountain biking has a completely different set of priorities. On a road bike, the seated pedalling position is vital. Standing up only becomes an issue when climbing (you won’t see many riders descending out of the saddle). I’ve also heard it said (and again I’m not an expert, nor do I want to be) that the shorter the wheelbase the better a slipstream you can get from the rider in front, because you can literally get closer without buzzing tyres. The fact that the stem and handlebar is sticking way out over the front axle when standing up climbing on a road bike is no big deal. It’s also why it’s important to stay seated when descending on a road bike to keep the weight behind the front axle as much as possible. So road bikes are designed to pedal well and draft well, but they are not designed with excellent handling performance in mind. I’d go so far as to say the handling of a road bicycle is actually terrible as a result and the short wheelbase and long stem must take some of the responsibility for that. Although it is a long time since I have ridden a proper road bike, the UCI has restricted geometry and stifled development, so I stand by the statement. One area where road bikes still influence mountain bike sizing is seat tube length. Consider this; the seat tube measurement relates to your saddle height, and therefore your seated riding position and inside leg length. That’s approximately half your overall height, or, as I like to think of it, the ‘half human’ measurement. The top tube and down tube length comes into play when you stand up – so that’s your upper and lower body, or ‘full human’ measurement. So why is it that seat tubes grow by 25-40mm between sizes, yet top tubes lengthen by 10-20mm? Surely it should be the other way round? If you’re tall, your options are limited. You can hunch yourself up and risk a big chiropractor bill, or perhaps evolve withered arms, like a Tyrannosaurus Rex. The fact is, some manufacturers are still trying to make their larger bikes fit by bunging on a longer stem. Argghhh! Why do the seat tube lengths need to change so much? Can’t we just extend the seat post? If I lifted the dropper post in my XL frame to the minimum insertion marker it would fit a 10-foot giant! To illustrate this point, I did some measuring. Joe Taylor is one of the technicians here at Mojo. He’s won a few Gravity Enduros in the senior category and is 5ft 6in tall (1,676mm). Joe’s seat rails-to-crank-centre measurement is 665mm and his crank-centre-to-handlebar-end measurement is 850mm. I am 6ft 1in (1,854mm), my seat rails-to-crank-centre measurement is 720mm and my crank-centre-to-handlebar-end measurement is 915mm. For both of us, our overall height is 2.5 times the distance between our cranks and our saddle and twice the distance from cranks to bars. A 125mm Fox DOSS dropper post has 93mm of height adjustment inside the frame. Enough, multiplied by 2.5, to accommodate riders with a 232mm (9in) variation in height! On the same medium frame! Going on our earlier measurements, that 232mm height variation would need 115mm of extra length from the shortest to the tallest rider. Given that 50mm is about the shortest commonly available stem, you’d be looking at a 165mm stem to avoid the tallest rider being bent double. Of course, there’s a flipside to all this. Joe could get on my XL Mondraker Dune XR (currently one of the largest mountain bikes in the world), run a normal seatpost, a 10mm stem and a low-rise bar and end up in exactly the right position. An XL! He’s 5 ft 6in! Perhaps, instead of road bikes, we should be looking towards our motorised cousins for guidance. Off-road motorcycles are designed with excellent handling in mind. 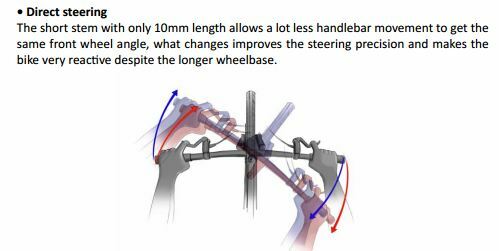 The relationship between the wheels, angles, suspension, mass and rider contact points are all performance-focussed, sacrosanct and fixed by the manufacturer. The riding position on an off-road motorbike is adjustable for a wide range of rider heights. If a tall rider and a short rider buy the same off-road motorcycle they can make small adjustments to the riding position using bar mount positions (typically 10 or 20mm forward or backwards), bar height, or even higher or lower seats (more or less padding). 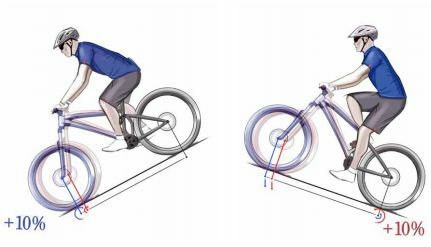 Essentially the two riders are in the same place between the wheels, and they adjust the suspension to keep the dynamic angles similar despite their different sizes. Joe could get his 850mm peg-to-bar measurement by using a low, rear-set, rolled-back bar. I could get my 915mm using a high, forward set, rolled up bar. Why don’t we do this on mountain bikes? Why do we need to buy a garden gate to get a decent length wheelbase? Downhill bikes are generally considered the pinnacle of off-road handling, and they are longer, slacker and lower than most mountain bikes. If that geometry is correct for speed and safety why on earth can’t we just arrange the rider on top of that vehicle with a correct seat angle for pedalling and climbing? Hell, we could even fit some really wide bars, and cut them down if we needed to rather than having to replace a narrow set out of the box. What I want to see is the whole sizing protocol turned on its head. I want the difference between frame sizes to be 10-20mm in seat tube height and 25-40mm in top tube/front centre length. 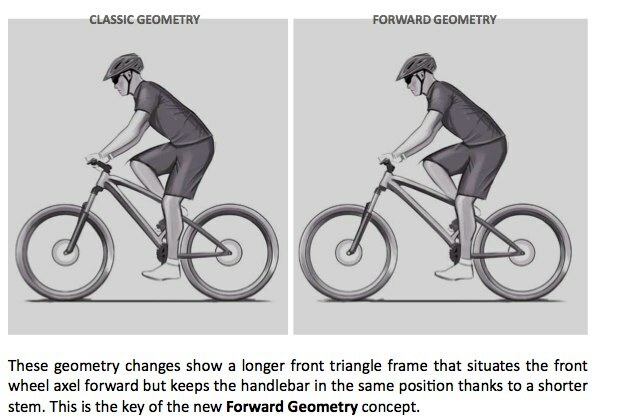 And I want bike designers to realise that fitting a longer stem isn’t the same as making a bike that fits.